Simply put, Mid-Century Modernism (MCM, or often spelled without the hyphen as "Mid Century Modern") was the period of architecture and graphic, industrial, and interior design popular during the 1940s to the late 60s. The overall aesthetic is one of simplicity: clean lines and sculptural forms. During this period, less really was more. High ceilings in common areas create room to breathe and provide airy, open spaces. MCM architecture puts warm materials to work: wood, brick, and stone make for inviting interiors - sleek and modern - but never sterile. These buildings often took sweeping and dramatic forms, fostered by improvements in building technology. The most popular and influential architects of the Mid-Century period include Eero Saarinen, Richard Neutra, Paul Revere Williams, John Lautner, and Joseph Eichler in the US, Alvar Aalto in Finland, Felix Candela in Mexico, and Oscar Niemeyer in Brazil. Google doesn't seem to recognize them, but there were of a bunch of renowned female MCM architects and designers too, like: Julia Morgan, Jane Parug, Rebecca Esherick, Ray Eames, Florence Knoll, and others. Here's a good starting point if you want to get more familiar with them. Mid-Century Modern architecture was imbued with the optimism of the post-WWII era, focused on expressing the idea that technology would pave the way for a better world. Futurism became a common theme in Mid-Century design, and nothing captures this theme better than the furniture and interiors of the time. The Mid-Century movement spanned disciplines, and the incredible furniture designed by Mid-Century architects has proven itself timeless. The sculptural, sleek forms of architect-designed furniture revolved around the new concept of physical ergonomics. This was the idea that furniture and other objects should be designed to complement the human body and prevent discomfort. New materials like plexiglass, fiberglass, and tubular steel coupled with new manufacturing techniques (such as improvements in molding wood) inspired MCM furniture designers to create pieces that seemed to defy physics, such as the Tulip chair by Eero Saarinen. It's easy to forget how revolutionary this chair was when it first appeared. These days, we're so used to seeing design that we skim over the fact that it's an engineering marvel - that slender base improbably holding up the single-piece, molded seat. The most popular American MCM furniture designers included Charles & Ray Eames, Eero Saarinen, Isamu Noguchi, Harry Bertoia, George Nelson, Paul McCobb and Florence Knoll. Knoll Ad for Eero Saarinen chairs (photo from the author's archives); Eames chairs on display (photo by Sarah Ackerman, CC-BY-2.0); Noguchi Coffee Table (photo by Maegen Tintari, CC-BY 2.0); Diamond Chair by Harry Bertoia (Photo by Sandstein, CC-BY-SA 3.0); Living room from a 1953 issue of Art & Architecture, with Coconut Chairs by George Nelson on the left. Scandinavian designers like Hans Wegner, Finn Juhl, Jens Risom and Arne Jacobsen were also popular. They brought a more natural and traditional approach to furniture design than did the poppy Americans. While Mid-Century Modern furniture is stunning and interesting on its own, one doesn't need to buy expensive architect-designed furniture or live in a modern house to enjoy the MCM aesthetic. For most of us, MCM looks are closer than we think. You don't need to spend $1500 for a single chair at Design Within Reach to decorate your home the Mid-Century way. A lot of the aesthetic begins even before we consider what goes inside. Here are some basic rules of Mid-Century Modern interior design, followed by some real rooms from the period and tips on how to recreate them on a budget. Get rid of the clutter! The modern look starts with open space and sparse decorating. Go minimal! Remove anything that makes the room look closed-in, busy, or chaotic - such as oversized furniture and cluttered trends like picture walls. The houses of the 50s and 60s were much smaller than houses are today, and families decorated sparsely in order to avoid feeling cramped. Let the light in. Natural light makes for an airy space connected to the outside world. Do away with heavy drapery and valances, opting for sleeker, monochromatic curtains or blinds. Find a focal point. Common areas such as living rooms revolved around a central focal point, usually a fireplace or large window. This orients the room and draws the eye to its most important features. I know it's hard ... but try, just try, to see if you can make that focal point something other than a TV. Notice the complete lack of televisions in most of these photos? Interior from a 1953 issue of House + Home showing a common wall color scheme of the time. Go Natural! Mid-Century Modernism emphasized natural materials: wood, brick, and stone. If you're lucky enough to have wood-paneling or a brick wall, embrace it! Rooms with lots of natural light benefit from lighter shades of paint. Consider light, cool base colors, warm grays and off-whites. Avoid the sandy beiges of the 2000s - they don't usually blend well with MCM furniture and patterns. Paint color? Go retro. 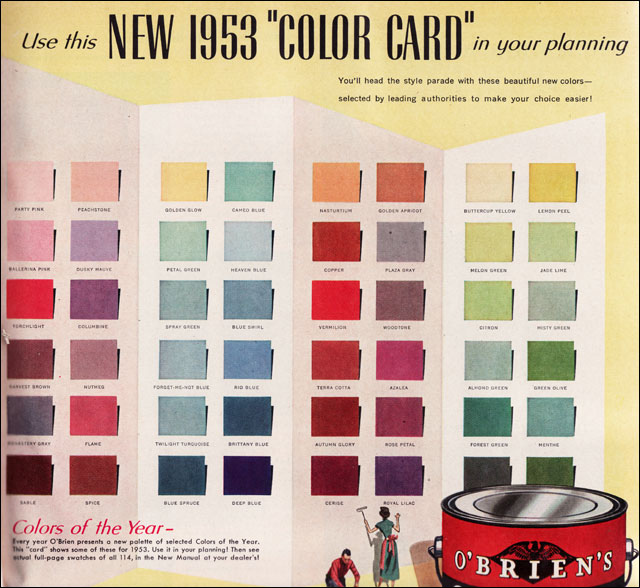 Check out these color palettes from the 1950s and 60s when choosing your paint. There's nothing like authenticity! You can be very modern without having to rely on shocking colors. Consider an accent wall, but don't go overboard. Busy and bold wallpapers may be fun, but the larger the wall, the less effective they become. Consider avoiding them in large spaces in favor of more confined rooms, like bedrooms or dens. In MCM architecture, the accent wall was often glass, and the accent was the outdoors! Mid-Century Modern interiors revolve around a few choice pieces of furniture. The goal is not to have as many famous chairs as possible in a space - it's about having minimal, open rooms that highlight each piece as unique. Accessories: 1-2 dramatic table lamps, an area rug, 1-2 pieces of wall art (large paintings and clocks were popular), curated items on display such as pottery or coffee table books. Storage system featured in a 1956 issue of Art & Architecture, demonstrating the idea of curating specific items, rather than packing shelves tightly. Photo from the archives of the author. MCM dining rooms rarely need more than a sideboard or credenza, a table and chairs, and perhaps a bar cart. Bedrooms? A bed, bookshelf, nightstands, a dresser and maybe an accent chair. Remember: openness is the priority for maintaining the style. Fortunately for most of us, Mid-Century Modern was unpopular throughout the 80s, 90s, and early 2000s (meaning people are still wanting to get rid of their parent's old furniture), as well as insanely popular for a the last decade or so (meaning there are tons of new and inexpensive MCM replicas or MCM-inspired pieces). Goodwill, the Salvation Army, or other thrift stores. Often-times, these places have no idea what they have, furniture-wise, and whether it has any value. Avoid going to stores near large cities, as these are usually picked over. Thrift stores in small towns tend to have the best finds and prices. Craigslist and similar sites. There are always some folks trying to get rid of stuff online. Hope that you stumble upon someone who's moving and needs stuff to go ASAP. Pro tip: look at Craigslist listings outside of your immediate area. Be willing to negotiate! Flea Markets. Don't be afraid to check out the local flea market - they often have great finds. Flea Markets are best for smaller items like tableware, art pieces, and accessories rather than big ticket items like furniture. Yard Sales and Estate Sales. While it can be tiresome to driving around to find them, yard sales and estate sales are great place to look for both large pieces of furniture and small items like lamps and clocks. Antique stores and vintage stores. These are great places to find unique pieces, but you'll definitely be paying more for them! Luckily for all of us, the Mid-Century look has seen such a resurgence in the last few years that the style is now affordable for the average Joe. This is a great example of how Mid-Century Modernism can free up a small space, making it look lofty and airy. For more looks from the past, try browsing Flickr for vintage magazine scans, or see if you can find books from the MCM period at thrift stores or used bookstores. I hope you've enjoyed this introduction to Mid Century Modern design! Kate Wagner is the founder and editor of McMansion Hell, a web site for people who love to hate the ugly houses that became ubiquitous before (and after) the bubble burst. Great Article! We are currently in the process of choosing exterior paint colors for our midcentury modern home. The photos of vintage exterior palettes shown here and other sites would be much more helpful if they were translated into current available paint colors by a color expert. Reading colors on a computer screen is impossible. Please consider this for a future blog or article. @david - thanks for the comment. As Kate wrote, it was a "period of architecture and graphic, industrial, and interior design popular during the 1940s to the late 60s." That seems perfectly accurate to me (and not in conflict with what you're saying). The Mid-Century Modern (MCM) Era didn't begin in the 1940's. It began in the early 1930's and ran parallel with Art Deco until it dominated a war weary world following the end of World War 2 in the Mid 1940's. The MCM "Look" continued until it was usurped by the Mediterranean "Look" and other retro looks around 1974 as a response to the tumult of the Era. Cheers.